Reeds are the heart of a concertina. They change the smooth flow of air in and out of the bellows into a rich series of vibrations the player has to draw on. While they are critical to the performance of the instrument they only control what is possible for a concertina, not the final sound that emerges. The rest of the instrument has a profound effect on the tone character and how well the reeds operate. Just like our vocal chords only generate the sound of our voices, the rest of our vocal system from our noses and mouths to the air passages leading to our lungs shape that vibration into the amazingly varied sounds we can make. Reeds serve the role of the vocal chords, the rest of the instrument controls the sounds they can produce. To be sure, there are ways to make reeds that will produce more of one sort of sound than others. 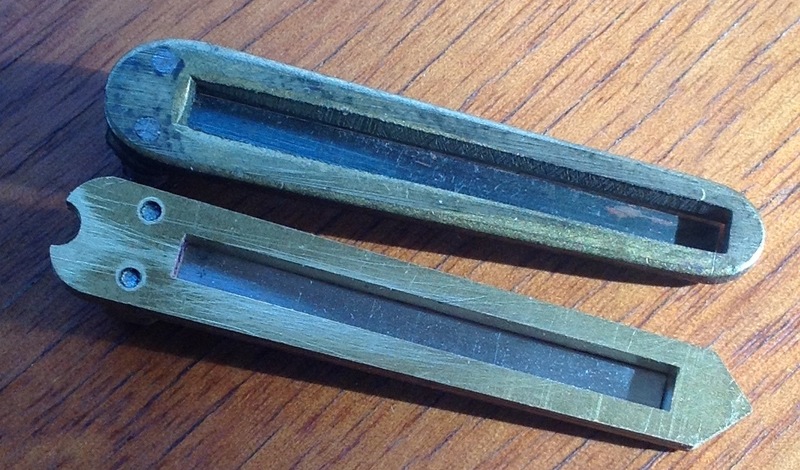 If you look at a set of reed organ reeds ( if you can find one these days ) They had a variety of ways of bending the reed tips and shaping the reeds to adjust the overtones the reed produced as it periodically cut the air flow through it’s window. None of these are particularly useful in concertinas which need the most efficient and quick responding reed forms possible. Within those limitations, you can make reeds that are very light and quick to respond, but can never get very loud, to reeds that are strong and take a little more effort to get them going, but are capable of a wide range of volume. If viewed from the side, reeds are not perfectly flat. They vary from thick at the clamped end, thin in the middle and thick again at the tip for the low reeds, to nearly level in the mid range, and finally thick at the clamped end to very thin at the tip for the high reeds. They are always curved at least slightly in profile to adjust the stiffness of the reed at a given pitch. Getting these “profiles” right and balanced from one reed to the next for the particular characteristics you want the reeds to have is an art for those who file them by hand, and a bit more of a science for those of us who design them on a computer screen and then go try them out. Neither method is superior to the other. The second can be quite a bit faster, but require rediculously expensive equipment, where the first method takes a lot of skill, sensitivity and critical observation, but hardly needs more than a few good sharp files and something to hold the reeds. Reed lengths and widths ( and taper if any) are chosen to try to get balanced volume from the large low reeds and the tiny high reeds, and to do it within the size limitations of the instrument. If you were to simply vary the length of a reed to change the pitch, you would end up with much longer low reeds than are generally used. in the low pitches, they get long fast. 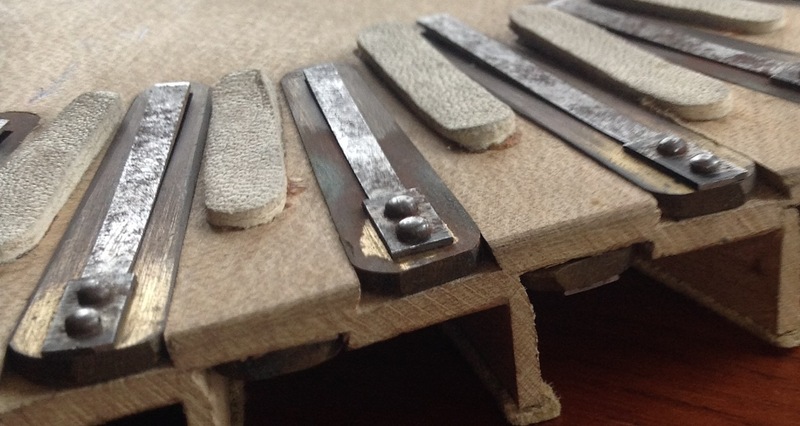 By chosing different reed thicknesses, and weight distribution, you can make reeds that cover the large musical range of the concertina and still be reasonable in size. Many factors go into choosing the reed “scale” to use. There are always trade off’s. I have chosen a long scale reed style because of it’s stronger fundamental tone in the low notes and better responsiveness than shorter more heavily weighted reeds, something I felt was deficient in many of the older Anglo concertinas. This is partly a mater of personal preference. This one was mine. I make my reeds starting with large sheets of brass for the reed shoes and reed clamps, and wide strips of reed steel I shear and grind into the individual reed tongues for each of the 60 reeds of the concertina. Traditional concertina reeds are normally mounted in tapered dovetail slots. The reed shoe sides match the dovetail slot and when slid home and the reed shoe fits snugly which is important for good sound. This method works well in places with stable humidity, but in places like New England in the US, winters are very cold ( down to -30 F where I used to live ) and house humidity levels drop to 10% or lower. summers see the humidity go up to 90%. This causes expansion and shrinkage of the reed pan and it's slots. When it expands against the reed shoe, the softer wood crushes, sometimes pinching the reed shoe sides against the reed causing it to jam. When it contracts in winter, it pulls away. After a few cycles of this, the slot remains oversize and the reed shoe needs shims put in to keep them from rattling or falling out.. I switched the way my reed shoes are held in the slot. They have a chisel point at the tip and a small semicircular cut at the base where a small flat head screw simultaneously wedges the reed shoe forward where the point mates with a small nick at the bottom surface of the slot, and also holds the base of the reed shoe tightly at the same time. Since the reeds are mounted in the direction the wood hardly shrinks at all, they aren't bothered by the movement of the reed pan. The other feature that distinguishes concertina reeds ( besides being a single reed in a shoe or "frame" instead of two reeds on opposite sides of a rectangular plate ) is the shape of the window the reed swings through. Accordion reed windows have walls that are vertical so the back side of the window is the same size as the front. Concertina reed windows are beveled so the reed fits closely at the opening where it is mounted, but the window opens out as the reed swings into the window allowing it to start dumping it's air early in its cycle. This allows the reeds to start at low pressures and have better dynamic range. Properly made reed shoes will vary the window taper with the pitch of the reed. Long low reeds will need little taper, where the small high reeds need much more to maintain an even playing pressure/ volume, comparable to the lower reeds. It is common for concertinas where this hasn't been taken into account, to feel harder to play especially on the right hand notes above the first G. Accordion reeded concertinas, having no back bevel unless the reeds are reworked, often suffer from this problem, sometimes to the point of making the really high notes useless. At one point, I made my reeds with a bell shaped bevel a bit like the curve of a trumpet bell. I had an early and wonderful Bb/F Jeffries that had been carefully belled with a file for each reed shoe and thought it would be an interesting thing to try. I found it made the volume jump up very quickly as the pressure was increased. This made for a very snappy response, but didn’t give the fine control of dynamics I preferred compared to the simple bevel that varied with the pitch of the reed, so I abandoned it. It is quite easy to re-work the reed shoes into this form if someone ever wished to have an instrument with that slightly honky sort of sound. 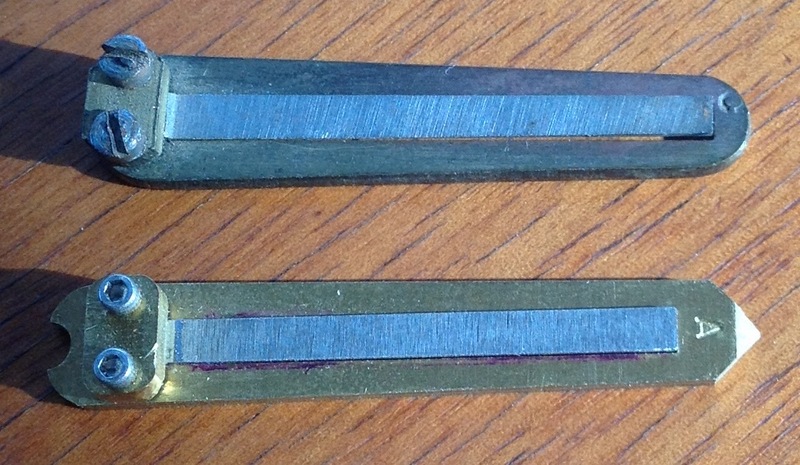 The actual thickness profile of the reed tongue also has an influence on the amount of bevel needed. Reed sets that are relatively light need less back bevel in their windows. These reeds can be very responsive but tend to have less dynamic range because they reach their maximum swing at lower playing pressure. Pressing harder won't increase the volume. Stiffer reed sets need more back bevel, but have more dynamic range. 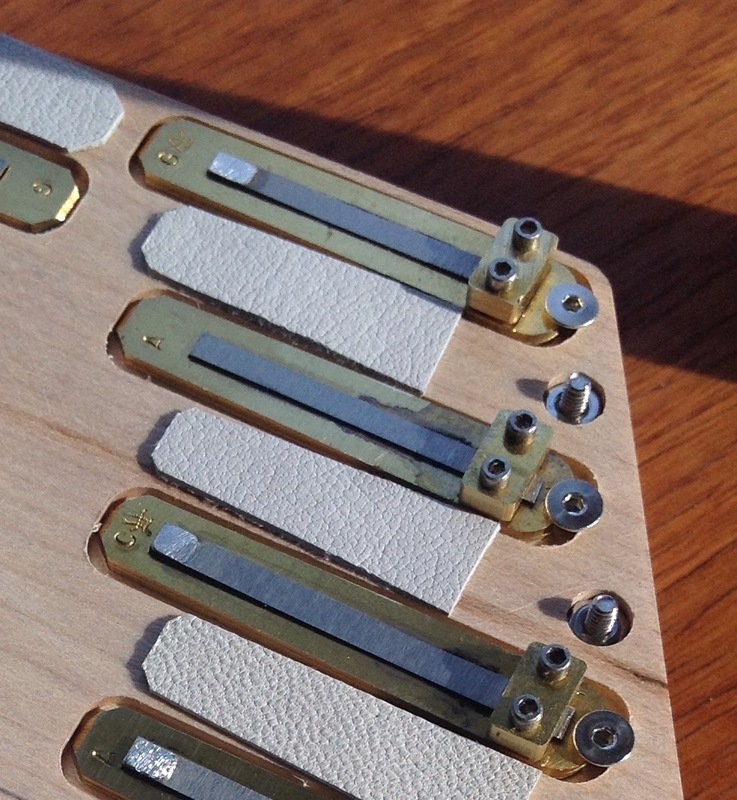 Different concertina makers have their preferred stiffness range when they make their reeds. I like slightly stiffer ones because I really like to use dynamics in my playing. What matters is that your beveling matches your reeds. Each maker finds what is right for their own reeds. Light accordion reed sets will be more successful in a hybrid concertina than a stiffer set because the lack of bevel makes less difference. Accordion makers with the large number of reeds sounding at the same time can’t afford the extra air consumption of the beveled windows and if they use it at all, they use very little. Traditional concertina reeds are mounted in slots in the face of the reed pan, while accordion reeds are mounted on the top edges of their chamber walls. Much of the concertina acts as a filter for the sound produced, allowing some frequencies to pass easily, while soaking up others and damping them out. The difference between the mounting method is one of the reasons hybrid concertinas sound different. I once cut a reed shoe out of an accordion reed plate leaving one of the reeds in place and shaping it to fit an old wheatstone concertina. In it’s new mounting, it sounded nearly the same as the other wheatstone reeds and not even slightly like an accordion. There are other aspects of the construction that can reduce the high frequency partials characteristic of accordions and some hybrids do a lovely job of this. Press side of Kensington reed pan showing how reeds are mounted. Getting a nice balanced tone across the entire range of a concertina is not an easy thing to do. Each reed from the lowest to the highest needs to respond at close to the same starting pressure so notes played at the same time sound at the same time, and notes play when you ask them to, especially in faster tunes. There are limits to this. The highest C on a C/G anglo will have completed 16 cycles before the lowest C has completed one. The lower you go, the longer they take to get going. Within these limits, we still have room to work. I spent a number of months carefully adjusting the profiles of my reeds to get an even gradation of stiffness that balanced the power of the reeds with a responsive playing pressure. Low reeds needed to maintain their pitch when they were played with volume instead of being forced flat by the incoming air. High reeds needed to reach adequate volume without having extra pressure applied. 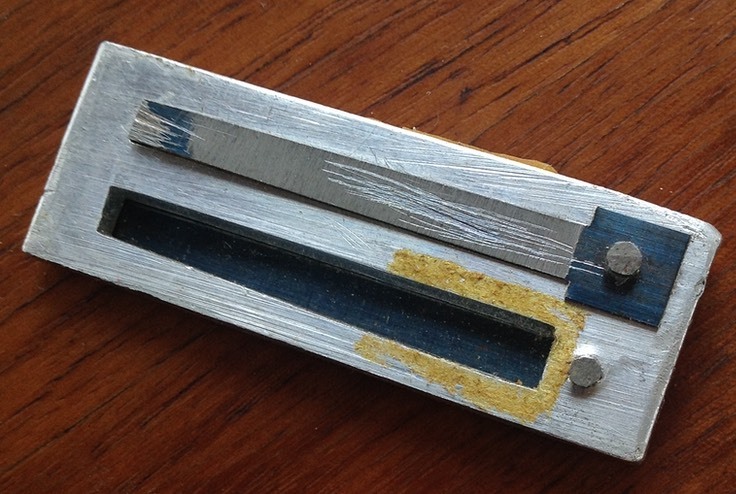 After my first concertina in the early 90’s, I made a simple device to measure the relative stiffness of the reeds in grams per initial 2 degrees of deflection. and came up with a set of reed profiles that varied smoothly in stiffness with low reeds that came in around 14, mid range reeds around 20 and high reeds back down to as low as 8. The resulting reeds maintained the feeling of all being part of the same family, with no breaks in character or demand for a different playing pressure from it’s mates. Because I was lucky enough to afford a CNC surface grinder back in my early days and dim enough to buy it, I was able to make sets of reeds that all shared the profiles I’d designed. 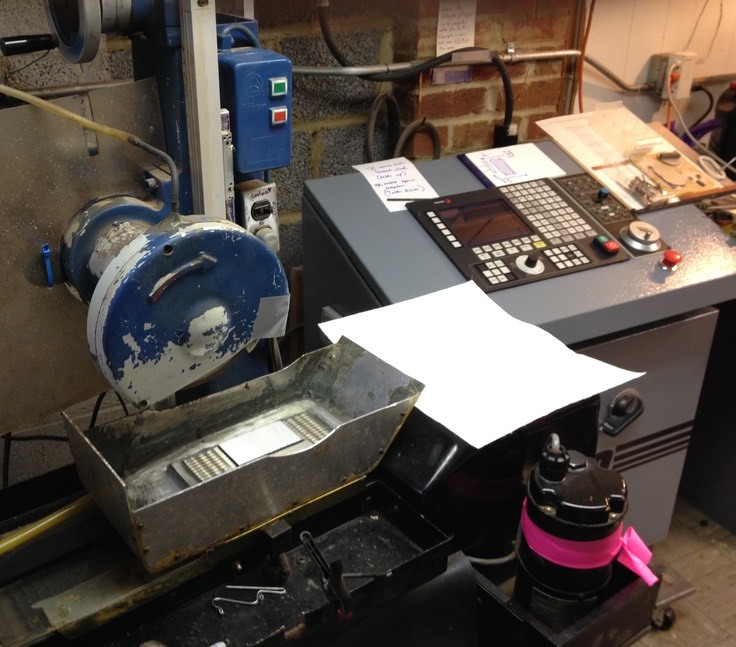 The CNC grinder makes it possible for me to dramatically reduce the time required to profile my reeds and fit them, as well as keeping them uniform from one concertina to the next. Fitting reeds is a demanding task. The reeds are typically only 2-3 thousandths (maximum) of an Inch (you metric folks will have to convert for yourselves ) narrower than the window they must swing through without touching and be accuratly centered. You cannot fit a standard sheet of typing paper between the reed and it’s frame. It is quite possible to keep the gap on each side of a reed to less than a thousandth of an inch, but this can create a lot of problems. First, reeds sound progressively harsher as the gap narrows even though they get more responsive up to a point. Second they cannot tolerate even the slightest misalignment or they begin to touch the reed window and make an annoying metallic tinging sound. Also, reeds that are not centered tend to go flat as the bellows are pressed harder, to a much greater degree than well centered reeds. In reeds with very low clearance, this effect is magnified. Centering is both more critical and increasingly impossible to accomplish adequately as the clearance is reduced further. I find that between 1 and 1.5 thousandths of and inch clearance per side gives both a clean tone and quick response without being vulnerable to the small amount of shifting a reed may experience after vibrating up and down multi millions of times during normal play. 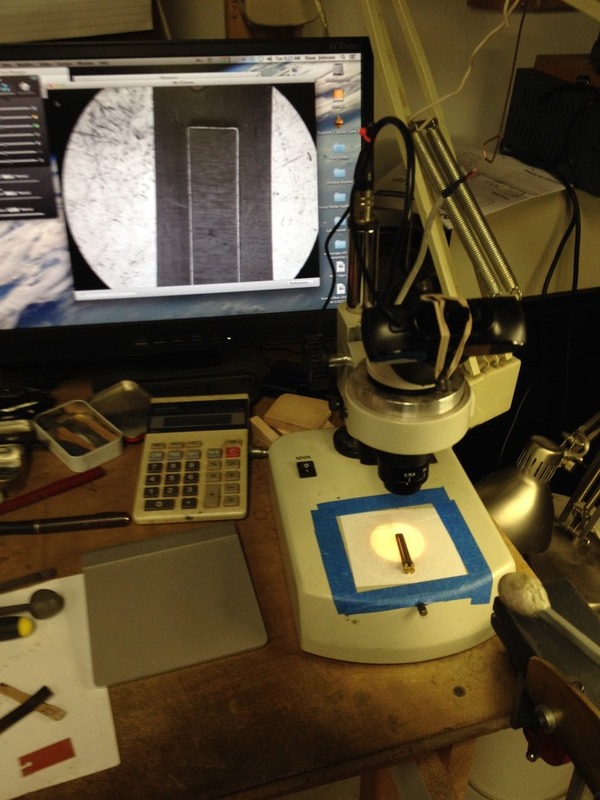 Most of the people I know who fit their own reeds use a low (10x-30x) power microscope to do the work. It can (and used to) be done by eye with a lit card as a background, but a small shift of your eye relative to the reed can give you an erroneous image of where the reed is sitting in it’s window. A microscope really helps get it right. This is also why I prefer to ask people to not try to adjust their own reeds unless they can do it under sufficient magnification. Having done it both ways, I’ve come to the conclusion that without a lot of practice, centering a reed that is grazing it’s window is a matter of luck. The more likely result is that you will make the reed unplayable until it is recentered under the needed magnification. While annoying, fortunately it rarely damages the reed badly. It is probably worth the cost to get it adjusted properly the first time, since you will probably have to do that anyway. Often if the reeds aren’t out of tune, Just the reed can be sent back for adjusting which is vastly cheaper than shipping the whole instrument. I do my best to have everything right when the instrument leaves my shop, but if for whatever reason a reed is not behaving as it should, I do whatever I can to correct the problem at no charge. I make my concertinas to be played and enjoyed. If they are not behaving, I am not happy. It is possible to make good concertinas with someone else’s reeds, but It is hard to make up for the insight and knowledge gained from making your own. These little pieces of steel and brass have many secrets. They don’t lend themselves well to theoretical analysis though you’d think they were simple enough. You can get to know them if you take the time to learn their language.